BSA A65 (1964-) Connecting Rod Billeted. Manufactured in the USA exclusively for Wassell. BSA A10 (1956-63) Large Journal Crankshaft Connecting Rod Billeted. Manufactured in the USA exclusively for Wassell. Triumph T150/T160/BSA A75 (1969-)Connecting Rod Billeted. Manufactured in the USA exclusively for Wassell. 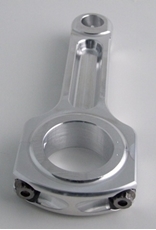 Triumph T100/T120 Pre Unit, T120 Unit ,TR6/T110 (1956-) Connecting Rod Billeted. Manufactured in the USA exclusively for Wassell. Triumph T140/TR7 (1973-) Connecting Rod Billeted. Manufactured in the USA exclusively for Wassell.